Young African Leaders Connect Camp 14 was inspiring week! Participants from nine African countries came together to learn and practice the skills to become strong communities leaders. The week was full of hard work, songs, and laughs! In early December 2016, sixteen participants from six countries met in Dakar, Senegal to participate in the 9th Connect Camp of the Young African Leaders’ Initiative (YALI). Participants were from Chad, The Gambia, Guinea, Liberia, Senegal and Uganda. The YALI Connect Camps are administered four times a year in four regions of sub-Saharan Africa, funded by the Bureau of Educational and Cultural Affairs (ECA) in the U.S. Department of State and administered by the Institute for International Journalism at Ohio University. These participants learned about leadership, mentorship, the Art of Hosting, Human Centered Design, and more. They interacted with resource experts such as Kofi Essien of OLE Ghana, Mamadou Sarr of Corps Africa, and Dr. Mame Yauto Faye of the Institute of Management in Dakar. A total of 30 young African leaders from six countries in Central and Eastern Africa traveled to Kigali, Rwanda at the beginning of December to participate in the fifth and sixth YALI Connect Camps, which are funded by the Bureau of Educational and Cultural Affairs (ECA) in the U.S. Department of State and administered by the Institute for International Journalism. The YALI Connect Camps have previously been held in Dar es Salaam, Tanzania and Windoek, Namibia. 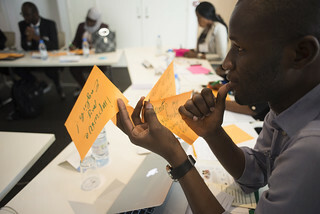 Fourteen young African leaders from six different countries have gathered here in Windhoek, Namibia to participate in the third and fourth YALI Connect Camps, funded by the Bureau of Educational and Cultural Affairs (ECA) in the U.S. Department of State and administered by the Institute for International Journalism. The Institute for International Journalism introduces and congratulates the first group of Mandela Washington Fellows alumni and their mentees for becoming the very first cohort to participate in YALI Connect Camps. YALI stands for the Young African Leaders Initiative. The first two week-long Connect Camps take place in Dar es Salaam, Tanzania from March 8th to 20th, 2015. The Connect Camps are funded through a U.S. Government grant from the Collaboratory, in the Bureau of Educational and Cultural Affairs (ECA), at the United States Department of State. Partnering with the Collaboratory, Ohio Universitys Institute for International Journalism in the E. W. Scripps School of Journalism will implement eight camps in Eastern, Southern, Central and West Africa. Participants in the first two Camps are from Kenya, Mauritius, Seychelles, Tanzania and Uganda. The Institute for International Journalism in the Scripps College of Communication at Ohio University is scheduled to conduct two YALI Connect Camps in Dar es Salaam, Tanzania in March. YALI stands for the Young African Leaders Initiative. The Connect Camps are funded through a U.S. Government grant from the Collaboratory, in the Bureau of Educational and Cultural Affairs (ECA), at the United States Department of State. Partnering with the Collaboratory, Ohio University will implement the camps in Eastern, Southern, Central and West Africa in 2015. The E.W. Scripps School of Journalisms Institute for International Journalism has embarked on a new international training project to provide guidance, consultation and tools to the young and emerging African leaders in sponsored by Citizen Exchanges-Professional Fellows Division in the Bureau of Educational and Cultural Affairs of the U.S. Department of State.